HCG has partnered with Red Brook Tenkara www.redbrooktenkara.com to offer you Tenkara Trips. 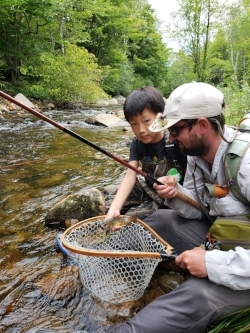 Tenkara is a Japanise style of fly fishing best suited to small streams. Tenkara fly fishing consists of the rod, a telescoping rod that can be adjusted in length up to 12ft 9", and braded dacron line that attaches to a short thick knoted rope at the rods tip. With no reel to worry about and a light line that helps flies flutter to the waters surface, Tenkara rods are deadly effective on steep broken pocketwater rivers. Here in the White Mountains our streams are perfect for Tenkara fishing and we are eager to show you what we mean! Mark Hagopian with a native brook trout he seduced with the Red Brook One tenkara rod. Hayden with his first trout on the fly...a buck male brook trout taken on the Red Brook One.